President Uhuru Kenyatta Cleared by IEBC and expected to address Jubilee supporters at Uhuru Park. - Bana Kenya News, Real African Network Tubanane. Home featured Nairobi President Uhuru Kenyatta Cleared by IEBC and expected to address Jubilee supporters at Uhuru Park. President Uhuru Kenyatta Cleared by IEBC and expected to address Jubilee supporters at Uhuru Park. President Uhuru Kenyatta was morning cleared by IEBC to vie for the Presidency in the August polls. The IEBC issued him with a certificate for his presidential bid to secure his seat. 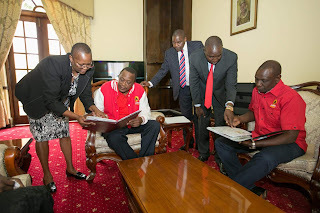 He was accompanied by his wife, first lady Margaret Kenyatta and Deputy President William Ruto. The Duos are expected to attend a major rally expected to have at Uhuru park as stipulated earlier. Jubilee supporters camped outside KICC waiting for the President. The supporters will accompany the president to the Uhuru Park where is expected to official launch his bid for the presidential race. The president arrived yesterday from Italy, where he attended the G7 summit with G7 presidents across the world. At the Airport to receive the President, Interior Cabinet Secretary Joseph Nkaissery and Chief of Defence Forces, Gen. Samson Mwathethe, among other senior Government officials were present. In his address to the summit, President Kenyatta asked the Group of Seven (G7) most industrialised countries in the world to enhance its collaboration with Africa to address global challenges including poverty, immigration, climate change and terrorism. The President said Africa is a vital partner in solving the world’s most pressing challenges.“This is the time to put Africa's aspirations at the heart of your plans. A freer, more prosperous Africa is a vital partner in solving some of the world's most pressing problems: poverty, immigration, climate change, terrorism,” President Kenyatta told the G7. He pointed out that Africa’s transformation is driven by innovation in which Kenya is a celebrated pioneer in the continent, especially in ICT. “That's why we have strengthened connectivity through the Smart Africa initiative, putting ICT at the centre of our development agenda. That's why the continent is developing an ICT policy and infrastructure to support one seamless digital market, to serve a billion people,” President Kenyatta said. The President also held talks with G7 leaders, focusing on forging a closer cooperation in trade, investment, security, technology-sharing and development. The President held separate meetings on the margins of the G7 Summit in Taormina, Italy, with Japanese Prime Minister Shinzo Abe, host Prime Minister Paolo Gentiloni, Prime Minister Justin Trudeau of Canada, German Chancellor Angela Merkel and newly elected President Emmanuel Macron of France. During his meeting with President Kenyatta, Japanese Prime Minister Abe thanked Kenya for hosting a successful TICAD conference in 2016. Prime Minister Abe informed President Kenyatta of Japan’s intention to support South Sudan through its official development aid. He expressed a desire to continue working with Kenya at the multilateral level including on the threat from North Korea. The meeting between President Kenyatta and Italian Prime Minister Gentiloni discussed cooperation in security, fighting terror and maritime matters. They also discussed increasing the volume of Kenyan exports to Italy, which currently include coffee, tea, hides and skins, fish, leather, fruits and vegetables, and cut flowers. With Canadian Prime Minister Trudeau, President Kenyatta discussed support for health care – an area in which Canada has great interest, democracy, investments and innovation. President Kenyatta extended an invite to the Canadian Prime Minister to visit Kenya. At the meeting with Chancellor Merkel, President Kenyatta emphasised strengthening ties between Kenya and Germany. Chancellor Merkel took the opportunity to officially invite President Kenyatta to attend the G20 Summit in July. President Kenyatta speech at the Uhuru Park is the only long waited before all aspirants go to the field hunting for votes. Yesterday the Opposition Leader gave out his statement on how the Canan claimed will be and described it in details.